Springtime is upon us, and with it come happy thoughts of warmer days as new life begins to blossom. 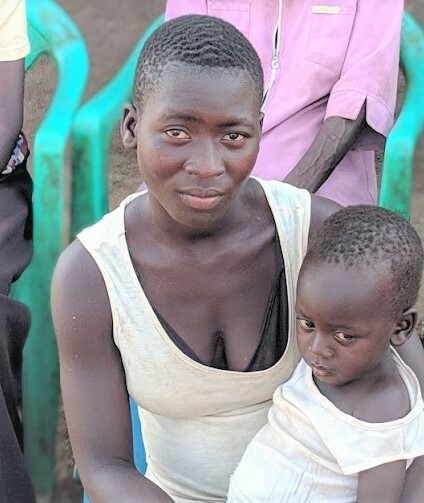 But for Ugandan, Nigerian, and South Sudanese girls like Viola—girls whose lives have been shattered, their voices silenced by war-time violence, displacement, and sexual exploitation—the hope for new life is far more profound and personal. This is Viola’s heart-wrenching story. I was born in South Sudan, in a village called Kaiya. I’ve never met my father – at least, I don’t remember him. When I was four years old my mother sent me to live with my uncle because she got married to another man. Today, you have the opportunity to help lift up girls like Viola from the depths of despair. You can join us in giving them the hope and the skills they need for a new life and a brighter future. And thanks to a $55,000 matching grant from two generous supporters of ChildVoice, you will double the impact of your donation and help us meet our goal of $110,000 by April 30! Your $25 gift becomes $50, $50 becomes $100, and $100 becomes $200, helping to support the therapeutic, social, and vocational training services that Viola and girls like her need to build a future for themselves and their children. Viola felt trapped and alone. But because of the vital work we are doing to help war-affected girls who have endured heartbreaking trauma rebuild their lives, her story didn’t end there. After learning of Viola’s many challenges, including domestic abuse, her ChildVoice caseworkers found safe temporary housing for her. Although she enjoyed activities in her local Girl Empowerment Group, it became clear that she was in need of additional services. Viola was thrilled to be selected for placement in our center-based program. She’s incredibly thankful for everything ChildVoice is doing to change her life. But this work would be impossible without the support of donors like you who care about the lives of vulnerable, war-traumatized girls. Click here to see Viola speak about her journey from heartbreak to hope. Can one person truly make a difference? The answer is “yes!” We invite you to join us today in making this incredible life-changing work possible. You can have a very real and sustainable impact on the lives of girls like Viola! Please don't delay. Take a few moments right now to invest in Viola’s future. Your generous gift is critical to help us meet our $55,000 match, and raise $110,000 by April 30. Remember, a $25 gift becomes $50, $50 becomes $100, and $100 becomes $200, providing vital therapeutic, social, and developmental support for girls who live in these conflict areas.